Airlines Terminal Bldg. -- perspective. 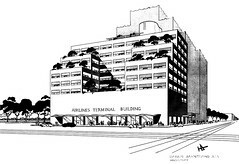 Harris Armstrong's 1943 design for an Airlines Terminal Building in downtown Saint Louis. Located on twelfth Street, the design called for parking below ground level and a transportation hub on the main level. The configuration provided for bus access via the alley behind the building. The second and third levels were to be reserved for a television and music recording studios. The remaining levels (fourth through twelfth) would be set aside for "general office space" presumably for lease. Setbacks allow for roof gardens at the fourth, seventh, and ninth floors. The 'T'-square and triangle symbol in the lower right hand corner was Armstrong's logo, forming his initials: 'H' + 'A'.